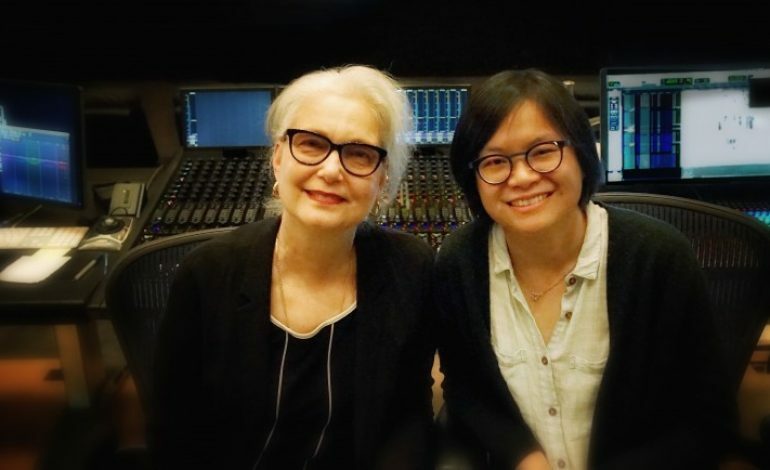 Mildred (Milly) Iatrou Morgan and Ai-Ling Lee, the first team of women to be nominated for sound for Sound Editing in Oscar history were nominated at the 2017 Academy Awards for their work as Supervising Sound Editors on the movie La La Land, the first musical ever nominated for Sound Editing. (Another Greek American, Mary Zophres, was an Oscar nominee for her Costume Design on La La Land). Mildred and her husband, Tom Morgan, live in Los Angeles, but they split their time between there and Astoria, New York, where Mildred was born and raised. In Astoria recently, Mildred talked with the GN about her work in general and La La Land in particular. GN: What features of your and Ai-Ling’s work on La La Land prompted the nomination? MIM: Musicals are often nominated for Sound Mixing but I believe this is the first musical nominated for Sound Editing. Those nominations usually go to Sound Effects heavy films with lots of guns and explosions. I think that we were nominated because the sound editing worked so well with the music and created this dreamy soundscape. GN: Are Dialogue and ADR and Sound Effects and Sound Design Oscars awarded every season? MIM: Every year an Oscar is given for Sound Editing and Sound Mixing. There are usually 5 nominees for each. I was lucky to be nominated this year for Sound Editing. My partner, Ai-Ling Lee was nominated with me for Sound Editing—we were the first all-female team to be nominated for sound editing. Ai-Ling was also nominated for Sound Mixing along with Andy Nelson and Steven Morrow. GN: As sound editors, you focus on Dialogue and ADR, and Ai-Ling is in charge of Sound Effects and Sound Design. What does Dialogue and ADR involve? MIM: Working as a team, Ai-Ling and I supervised the other sound editors and created the sound track—minus the music—for La La Land. Basically I’m in charge of all the spoken words including the actors’ dialogue and all the extras’ background “wallas” and dialogue. I start with the Dialogue which was recorded on set and is edited along with the picture. I have to remove any background noise and do whatever I can to make it as clear as possible. Sometimes I have to bring the actors into a recording studio to replace some of their lines because the production is too noisy, due to ocean sounds or traffic to name a few typical problems. This process is called ADR. I also have to record sounds for all the extras you see in any scene. The extras are usually silent during filming but to create a sense of reality I have to record them talking in the background in a restaurant scene or cheering in a concert scene. GN: Did you have to bring actors back to replace any lines in La La Land? MIM: We brought Emma Stone and Ryan Gosling into the recording studio for ADR but mostly for added lines of dialogue to clarify their characters’ motivations, for example when Mia is talking to her mom about her new boyfriend, Sebastian, telling her that he doesn’t have a real job but is going to open a jazz club one day. This prompts Sebastian to accept Keith’s job offer. Damien Chazelle didn’t want to use ADR to replace dialogue, except when absolutely necessary because he wanted the dialogue to sound natural. When we did use ADR we just replaced a word or a syllable for clarity. G: Did you encounter any difficulties in working on La La Land? MIM: The trickiest challenge was to have seamless transitions between the dialogue scenes which were recorded on location and some of the musical numbers where the singing was recorded in a studio. We had to make those transitions invisible and seamless so the audience wouldn’t be distracted by the change in the sound quality. Also, some of the songs were recorded live on set so for those scenes a lot of work had to be done to remove the noise from the set. GN: How did you get into sound editing? MIM: I got into it by accident. I always loved sound and while in film school made a film with an elaborate sound track. But I didn’t realize I could do that as a career. I had wanted to be a picture editor but I kept finding work as a sound editor. It was as if the universe was trying to tell me something. As soon as I embraced sound editing as a career very interesting things started to happen for me. GN: What movies have you worked on that stand out for you? MIM: Well, La La Land is my current favorite because it was fascinating to work with an artist like Damien. He’s very hands on and his artistry and attention to detail were inspiring. I also loved working on Wild with the director, Jean-Marc Vallée, another true artist. Jean-Marc also edits his films and does some sound work so we have a really good starting point and idea of what he wants. Cameron Crowe was really fun to work with too. Ai-Ling and I did the sound for his film, We Bought a Zoo. GN: Was this your first Ocar nomination? Ai-Ling’s first? MIM: Yes, it was a first for both of us and we were the first team of women to be nominated for sound editing in Oscar history. Ai-LIng was a double nominee because she was nominated for sound mixing too. GN: What was a difficult movie that you worked on? MIM: All the movies I work on have a difficult aspect. There never seems to be enough time or money and at some point, during the process I get the feeling where I wonder, “how can I make this budget work?” But I always do. GN: What are you working on now? MIM: Ai-Ling and I just finished the sound on Battle of the Sexes, directed by Valerie Faris and Jonathan Dayton about the 1973 tennis match between Billie Jean King and Bobby Riggs. It stars Emma Stone and Steve Carell and comes out this fall. It’s about Billie Jean King’s battle to get equal pay for women in sports and it’s a fascinating story. Many of the scenes are stranger than fiction! the Arts and made short films while working at the Museum of Modern Art, where she met her husband, Ronald Morgan. They began collaborating on a series of videos that were shown at museums and international film and video festivals. They eventually moved to San Francisco where Mildred pursued her film career and worked for Francis Ford Coppola as a sound and picture assistant and documentary film editor. Ten years later the couple moved to Los Angeles where Mildred focused on sound editing for feature films. Since then she has been working as a supervising sound editor for Fox Film Studios, Lionsgate, and New Line among others.